Cut each roll in half. Pour butter into a 12-inch Dutch oven. Roll cut rolls in butter until coated and arrange in Dutch oven. Sprinkle with cheese and bacon. Cover with lid and let rise until double. Bake at 350°F 20-25 minutes. 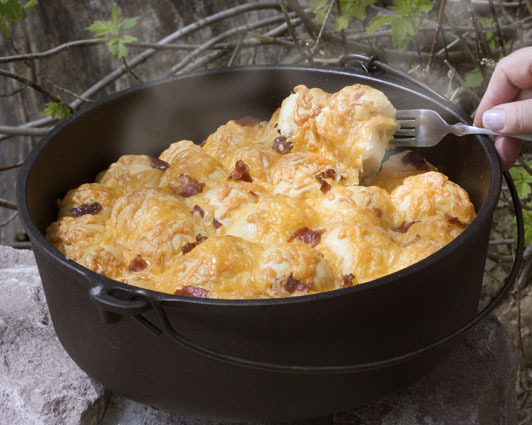 This Dutch Oven Bacon Cheese Pull Aparts recipe is from the Rhodes Bake-N-Serv Cookbook Cookbook. Download this Cookbook today.